The momentum build up that culminated in the Club night and the reveal of the first artwork has well and truly been lost. I think that there is a general assumption that we are waiting for something to happen and after the announcement by Sterling Beaumon that, there is no math, science, puzzles, or alternative reality, we might expect to be given something to whet our appetite for the next picture frame. 1. The Unusual pixels on the club night photos. Since the final picture turned up on the hub page there has been much speculation about the extra pixels on the right side of the image. This montage should help explain what we mean. On the left are the two pictures, in the middle is a zoomed in version of those and on the right are the pixels combined and zoomed in to see that they do indeed match up. Update - Macdaddy has posted in the comments to say that the red markings on the video frame is "FRAME #2 - 8/26"
If Macdaddy, or anyone else, can get a clearer screenshot of this then please send it in. At the moment there is no other supporting evidence to say this is correct. 3. Odd spelling / site mistakes. See the timeline / research thread for more details on this, but unless someone is very sloppy these are deliberate mistakes. If there are any theories or thoughts on this please comment away. My theory is: I've been following this art project as a whole, and by far this site has the oddest coverage of all of the sites. ALWAYS complaining about what's going, but still ALWAYS covering it and theorizing anyway. It's a lot like if the Comic Book Guy from the Simpsons had a LOST ARG blog. Either follow it or hate it and ignore it. It's me. I did Anonymous purely cause I was watching TV and didn't realize it. I post on another forum as well, but figured since I read he wasn't able to decipher the youtube message, I'd help him out. I genuinely still believe that the main homepage posts here are negative. Read them again. Sure, the comments may not be, and mine might have been (with info p.s. ), but to run a LOST ARG site and be so bitter about what they're doing - I mean, you have to admit that's pretty "fanboy"
Yes, fanboy is waaaay more applicable to people who follow viral marketing (how many times must they say it's not ARG), then people who dedicate websites to ARGS to complain about things not being an ARG. "Oo"
and whats now your point? Why dont you just leave? Thats what your saying if you hate it ignore it, so why dont you do that with this site? Capcom - it's "abruply," but am going to run your extra "up" into all my anagram decoders for this "ARG" that I hate but still run a site detailing. BRB. Point taken. I'm gone. You're welcome for the YouTube spotting of "Frame #2 - 8/26" - can't wait until you post everything about what happens that day, then talk about how much you hate it. Bye. I made 2 screen captures of this video uploaded by TysonGivens (btw that's a combo of the last names from Mike Tyson & his former spouse Robin givens. This guy also runs the customer service email, as it's TGCustomerService@...). Sorry, back to the topic. These screen caps looked like hidden images to me. I am just wondering whether anyone here could watch the video @ 2:21 & 2:22 too? Just to make sure I am not seeing things which aren't there. LOL It's amazing what boredom will do to people. Now for what I really came here for. 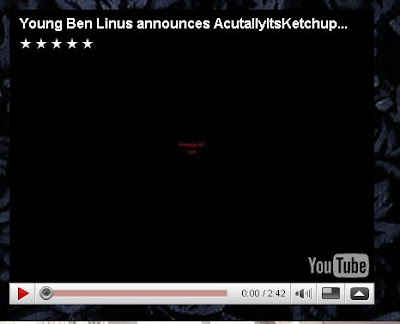 zort if you zoom in on the red section in the "young Ben" video it looks similar to the pixels on the picture to me. I don't think they are pixels just similar looking. But of course of course I could be wrong. You never know Sayidsgirl, it is good to take a look at anything odd at least once. Hey guys - I think maybe you're on to something Zort! Thanks for all your very hard work! I'll keep checking in even though I don't feel like I have a whole lot to contribute at this point. I'm trying to get my Lost rewatch caught up since this is my last week of freedom before a very busy schedule begins! And just for the record, I have always felt very welcome here, and have made friends here, too. I hope nobody feels too put off by a few rude-ish comments. This is the only blog or forum that I've been to that hasn't eventually turned into name calling and bitter he said she said comments. I've always felt welcome and have never been disrespected. I consider it my home away from home with many friends to visit. Whoa there, take a step back from the blog. I take an hour out from pressing F5 and look what happens. I'm sorry you feel the posts are negative Macdaddy, I think it must be my British sense of humour that is doing it. As Capcom says in that spirited defence of this site and TheLostcommunity everyone is welcome with whatever opinions they have as long as they are polite. If you are still around, thanks for the heads up on the YouTube frame, is there a better quality version somewhere, or an enhanced one that you could point us at ? Capcom, oh no apology needed as I didn't post those comments about the pixels here. I will send the screen captures mentioned in the previous post to the admin address. Just need some 2nd opinion. If I am seeing things which aren't there, then I can simply get back to what I actually should be doing... like work. So we're going to get frame # 2 on 8/26 then? Looks like it, although I can see "FRAME #2 - 8/26" if I squint enough, I'd love to see a clearer picture of it. I haven't got the skills to make this readable from the small, low quality, version we have in the video. Yeah ByronicX, it's actually quite hard to tell with all the other regular-looking flashes there. I had to go watching videos made by other people such as the one linked on BMP's site & the one by Hollywood Bob for some comparisons. Wow...haven't seen nastiness in quite a while here. In no way are any post here by our wonderful Zort come across as negative or complaining! I've always felt comfortable and friendly here and welcoming to newcomers. Sorry some people misread things somehow. As I said in the previous post: I still feel that TPTB don't won't us going crazy here and that a big hint will go out before the next Frame is filled. The Frame#2 8/26 seems like that. There are a lot of people who enjoy digging for clues, etc. and I say let them do so without putting them down. It seems this viral marketing can be enjoyed on many layers by all. Just want to add that I agree with Zort70 that one of the odd flashes I captured is just lens flare. Thanks for all the support, it's much appreciated, but the two sites wouldn't be the same with all of you guys. someone woke up on the wrong side of his corn flakes this morning !! I love this blog and have made great friends here. I have forums that I go to but I keep coming back here because it's home. Ignore, ignore ignore is all I can say. I was just thinking that it's weird that Sterling Beaumon introduced himself as Little Ben & he specifically said that the DI sent him. @roxanna and then he proceeded to profess that there is no alternate reality and no puzzles. contradictory statements dont you think? Little Ben also seemed as if he stumbled a little when he was saying all of that. It looked as if he were reading from a script so maybe the mistakes were intentional just to add to the list we already have of mistakes on the site. Talking of mistakes, didn't Darlton say that in the series there are hardly any continuity errors. Errors that we may have picked up on are not necessarily errors at all, so it might fit in with that. Well if macdaddy is right and we are waiting until next Wednesday then we have a weekend off. I'll keep checking in just in case ! Or we'll send The Doctor to get you, heheh. Capcom, have you been watching Ugly Betty ? I was half-watching it until this past season, then I forgot to watch. ...nothin' new yet at DCAAPB. Anyone see the embedded video in the JJ Abrams article on the Wired mag site for the May Mystery issue (edited by JJA)? He mentions specifically looking for odd borders of images, typos etc that may seem innocuous but aren't. He says to dig.... keep it up lostargs. Here's the link to the page with the JJ video that ytimetravel mentioned. They're talking about the puzzles in the magazine. But it is interesting considering the things we have been finding at DC&PB. I have been interacting with macdaddy over on dark. I called him out on his method of what turned out to be him just guessing. He seems to be young and easily excitable. B. An ARG insider who was bad at his job and screwed up getting the clue in the video. he did not react terribly maturely so, I am fairly certain it is A, or C. someone that thinks his guess is right and cant stand being called out on being just a guesser. Thanks for that link Sayidsgirl! And thanks ReverendMilo for the follow-up info on our interesting guest yesterday. That was quite a curious event, and Zort our frontpage poster, has surely posted nothing negatively that would deserve being called out to that extent. What I find doubly curious is that this person hasn't posted his views over here, so that no one here has ever had the chance to shoot down any of his points or "finds". ??? Ah well, live and learn, and hopefully that person will. Thanks again. and come to your own conclusion. So...where does this leave us. Did the red writing in the video actually say "Frame #2 8/26"? Guess maybe we need to take another look at the clues...eh? Thanks, ReverandMilo, for following through with that. It certainly came out of left field and totally unwarranted! It does seem that the next poster will be released 8/26. This is going to take a laid-back, lazy pace! I just want to thank Zort and all of the others who take care of LOSTARGS and TLC for all you do. And to everyone here, thank you. I've been around since TLE. Last year, I had some serious health problems. I was in and out of the hospital and laid up for months. Checking in with you all was such a comfort to me. I couldn't do much but I could always visit with you. This is a positive gathering of online friends that I have treasured through the past few years. Thank you. I'm hoping that show will be as good as it looks. I follow Jorge Garcia's blog and he wrote saying "All I'm Going to Say Is This: I read 'LA X.' And it's pretty freaking exciting." BarbaraJay I hope things are ok now, or at least on the road to getting better. I've not heard much about Flash Forward, but what I have heard does sound good. I've just watched the video for Wired magazine and it looks brilliant, I'll have to see if I can get a copy. There is a shot of the Lost lottery ticket with the numbers on it as well, with some other numbers which looks like a puzzle of some sort. I seen that. I took a screen shot too. To see if I could figure out what kind of puzzle it might be. It was kind of interesting that right before they showed the ticket the narrator said, There are puzzles that are really obvious and then there are puzzles that are less obvious. But since I'm lousy at puzzles I probably won't. Which makes you wonder why do I follow Lost ARGs? Beacause I like puzzles. Even though I'm crappy at them. And I love Lost. I'm going with my husband to his class reunion tonight. So if anything should happen I'll probably miss it. BarbaraJay- I remember you were going through a rough time as well and I'm glad you have been able to stick with us. And glad you're back on a more frequent basis now. @roxanna: Yes, it does make it seem real to "hear" one of the cast say the title! And he also is filling out his start paperwork for Lost for the last time! Just got back from seeing the Time Traveler's Wife. So a question for all of you who've read the book: does the book deal with the time traveling issues any more than the movie? The movie really just made it a sad,doomed love story- but didn't really address time travel issues so much...so wondered if the book did. If so, I may go read the book. I see now why we've referenced the book when talking about LOST now. I went to see it last night too ! Yes you can definitely see the Lost connection there, but I can also see a link to a few other TV series over the last couple of years. The projectionist at our cinema managed to get one of the reels in the wrong order, so it made a story about time travel even more confusing. Although we were the only ones that noticed ! LOL Zort, sheesh! For everyone who wonders about the movie vs book differences (that would be people like me who didn't read the book yet) the following link has a brief comparison. I'm sure that Memphish could inform us more if she sees the movie. Hollywood Bob got his # poster today! Did'nt find anything on it yet. He will look at it with a black light tommorow. He said the glow in the dark was cool. He posted a link to picts over on Dark's STV page 106. Thanks Pam, I've just had a look and bob seems to have number 130 out of 300. Geez. Where's my poster! Bob, you lucky guy. Maybe because you're are in LA. I am poised with black light awaiting. I should be 112/300. Are we thinking midnight Tues. or midnight Wednesday? Trying to anticipate sleep deprivation. Just to point out. When you ordered the poster the confirmation said 3-4 weeks for delivery. I find it interesting that the posters are getting out ASAP. World is a crazy an interesting place in black light. Let us know when you get it LotteryTicket as it will be great to compare them. Technically we still don't know if it will be Wednesday at all, the information from Macdaddy is not confirmed with any degree of confidence, so we may still be looking for the next clue. It has been over a week since anything has really happened! They better do the next one Wed., or people will really lose interest. BTW: Lotteryticket...if you have pets, don't look at your carpeting with a black light! You'll be grossed out! As I said before, I do not beleive Macdaddy could decipher the text the way he said he did. If he is correct, he is a damn good guesser or an ARG insider, and his reactions to my prodding revealed less maturity than expected. No pets. No carpet. But I understand your comment. Thanks RevMilo, Sayid's girl and I have tried all sorts to get a better image but definitely no joy in making it any more legible. I've re-posted the Holywood Bob pictures of the poster.